The term competencies (singular competency) has become widely used in Human Resources management and recently in training and career guidance. The aim of this article is to discuss its origin and evolution and the implications for career guidance. Please note in this article we don’t deal with the similar term ‘competent’ and the derived ‘competence’ because their meaning is clear and diverse: competent means ‘able to do something well’ (Cambridge Advanced Learner’s Dictionary Online, 2008), competence is the quality possessed by competent people (in the same way, for example, that beauty refers to beautiful). Each personal characteristic which (usually combined with others) allows the effective execution of a particular task in a given organisation. In McClelland (1973) competencies are ‘task and organisation specific’, that is to say they are described and exist only with reference to a specific work-related task carried out within a given organisation. For example the fluency in German language is a competency only if it constitutes an essential element for the effective carrying out of a given role in a particular organisation. So for McClelland in each given organisation a specific and unique group of competencies (a ‘competency model’) can be identified. It is worth highlighting that in this definition competencies are not ‘concrete’ factors in the same way as personal characteristics such as ability and aptitude. The term competency is only a generic term (a label) used to indicate the personal characteristics which, from all those possible (for example knowledge, transferable skills, technical ability, character traits, attitudes, aptitudes, etc. ), are considered important each time. The term competencies allows reference to such factors without having to list them every time. ‘an underlying characteristic of an individual, which is causally related to effective or superior performance in a job’ which could be ‘a motive, trait, skill, aspect of one’s self image or social role, or a body of knowledge which he or she uses’. In addition, in his study, Boyatzis identifies a core of transferable competencies which all effective managers, whatever their line of work, tend to possess. Even though for Boyatzis competencies remain task and organisation specific, his extremely broad definition, for better or worse, paves the way for the concept of competency as a generic personal characteristic unconnected to a specific work context, yet still connected with ‘effective or superior performance’. Each personal characteristic which (usually combined with others) can lead to good general work performance. 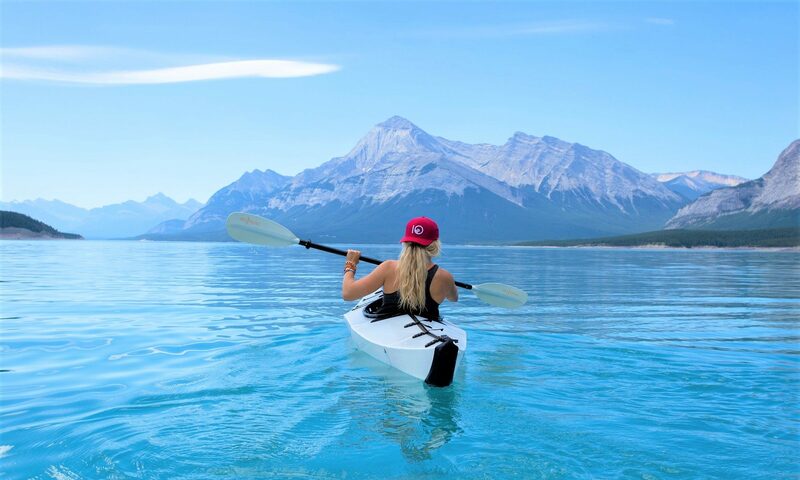 Each personal characteristic generally utilizable in the workplace, in school or in ordinary life, regardless of the nature of the work or level of performance achievable through its use. In this ‘updated’ definition, the term ‘competencies’ ends up meaning all those personal characteristics generally utilizable in the different life contexts (work, school, etc. ), regardless of the performance achievable through their use. The reference to good work performance has been left out because many of those on education or training courses or undergoing careers guidance are still a long way from a work environment (and so the quality of their work performance is neither measurable nor predictable), or are not necessarily in a position to provide a good work performance level. So, competencies have simply become personal resources to be used in the life regardless of the performance level they succeed in providing (note 2). Formulating a profile of competencies then becomes simply a matter of working out a ‘set’ list of those characteristics (personal resources) possessed by an individual which the adviser, based on his/her frames of reference, considers useful for work purposes. Over the years the competencies approach has come to incorporate various theoretical developments originating from the study of personality and thought processes. For example, it has been possible to easily include (among transferable skills or character traits) meta-cognition, meta-competencies (note 3), self-esteem, self-efficacy, and emotional intelligence that were not initially present in McClelland. How effective is this approach to identify competent people? 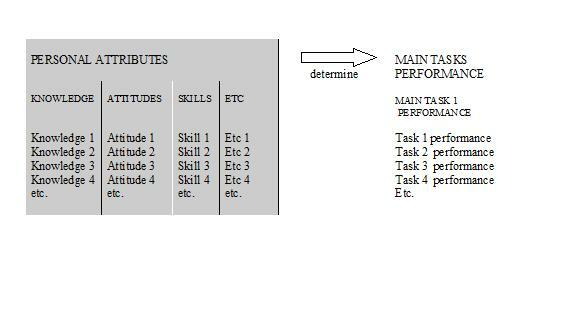 When we examine a person at work, we see personal attributes (left side of the table below) determine performance on tasks to be carried out (right side). To identify competent people we can so focus either on what a person has (intelligence, social skills, precision, technical knowledge, etc.) or on what a person does when at work. We have seen the meaning of the term competencies has changed over time from high work performance, context specific personal attributes to generic life performance personal attributes. However, all the different meanings of the term share the idea competencies are the pre-determining factors which make possible work performance (left of the table). But this is an indirect approach, that is to say speculative: if the person holds the prescribed personal qualities than PROBABLY will be capable to carry out effectively the tasks of a job. A better way to identify competent people is to focus the assessment directly on how the person performs his/her job (right side of the table) (note 4). Differences between the two approaches are clarified also by the possible questions in an assessment interview. An interview focused on personal features (competencies) will use questions such as (McClelland 1998): ‘What motivate you in work?’, ‘What do you think are your strong and weak points?’, ‘How do you deal with stress?’, ‘Describe the worst project you worked on’, ‘Describe a time you had to work with someone you didn’t like’, ‘Describe a successful outcome you accomplished working in a team’ and so on. An interview focused on performance (aimed for example at assessing competence to carry out a career guidance interview) will use questions such as. ‘Which are the main steps of your interviews? How do you start the interview /explain your role / explain privacy arrangements / ask permission to take notes / end the interview ? What are the main challenges in managing an interview? How do you address them?’. It is evident this way a better picture of personal competence results. The competencies approach comes out as a second best, useful only when is not possible to observe directly the person carrying out a job, as for example in recruiting or in career guidance. When instead dealing with people at work, then performance based approaches are more precise (Evangelista 2008). Careers guidance can be defined as a range of activities to help individuals in planning and managing their careers (Kidd 2006). Some clients who turn to careers guidance services do not have a professional goal. According to Parsons (1909), professional goals must be identified taking into consideration three large groups of factors: (1) a clear understanding of yourself, your aptitudes, abilities, interests, ambitions, resources, limitations, and their causes; (2) a knowledge of the requirements and conditions of success, advantages and disadvantages, compensation, opportunities, and prospects in different lines of work; (3) true reasoning on the relations of these two groups of facts.’ There is debate on the meaning of ‘true reasoning’. The idea is that there is a correlation (though not a strict one) between specific personal traits and success in particular roles and vocational fields, and that professional goals should also be chosen on the basis of such characteristics. In any case, Parsons position is an extremely modern one. When he listed, in 1909, the factors on which good work performance depends, he identified those elements of personal characteristics whose subsequent ‘discovery’ (in 1967) was to make McClelland’s name. So, since 1909, careers advisers have been following Parsons approach when working with those without a professional goal and have asked that they study in depth and get to know their own personal characteristics (including their work related skills, however acquired). In light of Parsons exposition, the use of the concept of competency in careers guidance would not seem such a big step forward if not for the possibility of using terminology in common with the world of work. It is helpful to distinguish between identification and measurement of competencies. ‘Identification of competencies’ can mean ‘an activity aimed simply at identifying the competencies an individual possesses’. Whereas ‘measurement of competencies’ allows to judge the quality and/or the value of competencies. In the process of identification, competencies are a discrete variable, either they exist or they don’t. The assessment is not concerned with measuring them but only with establishing their presence. The simplest method of identifying most of a person’s knowledge and technical ability is to look at her/his CV, or to ask her/him to describe her/his career. Transferable skills can be inferred by the person’s account of his/her work or life experiences, as in the previous paragraph. In the process of measurement, on the other hand, competencies are a continuous variable. They are meant to be valuated in the most objective way possible and, with this aim in mind, various techniques are generally combined. Competencies are usually measured in HR management. Measurement here has an ‘outward’ significance, so to speak, because it is carried out in order to compare one person with others or with specific standards and provide external parties with useful facts on which to base a decision (for example, whether to employ him/her). So, for this reason and also because of the possibility that the person being interviewed may try to deceive the interviewer, assessment of competencies must be extremely detailed. In career guidance on the contrary competencies are only identified. The identification has a particularly ‘inward’ significance because it is carried out in order to allow the persons, with the help of the adviser, to improve awareness of their characteristics and, based on this, identify a professional goal. There are not other competitors, the relationship between client and adviser is one of complete trust, there is not reference to a real job place. For these reasons, in a cost-and-benefit perspective, the profile of the client can be less precise. (1) Many authors confuse competency/competencies with competence/competences, thinking different spelling reflects not different meaning, but only difference between US and UK English. For example CEDEFOP (2007) under ‘Spelling and use of English’ advices authors, when submitting manuscript for publication, to use ‘competence’ and ‘competences’ instead of ‘competency’ and ‘competencies’. Also the European Commission use routinely competence/competences , see for example Recommendation of the European Parliament and of the Council of 18 December 2006 on key competences for lifelong learning (2006). (2) It is worth noting in greater detail the evolution of references to individual physical characteristics. In the definition by Boyatzis (1982) there are no references to physical characteristics. In that of Spencer & Spencer (1993), there is reference only to ‘dynamic’ physical characteristics such as visual acuteness and reaction time. In the definition of competency as a generic personal resource utilizable in the workplace, also ‘static’ physical characteristics like, for example, height and appearance, can be considered as competencies. (3) Meta competencies are personal attributes resulting from integration of several other personal attributes. For example the meta competency ‘Managing for Results’ may involve the ability to stress accountability, continuous improvement and customer service to make timely and effective decisions, and to produce results through strategic and tactical planning and the implementation and evaluation of programs, policies, and processes. BOYATZIS, Richard. The Competent Manager: A Model for Effective Performance. Chichester: John Wiley, 1982. CEDEFOP. Presentation of CEDEFOP manuscripts for publication in English. Dated March 2007. Thessaloniki: CEDEFOP. Retrieved on 8th October 2008 at http://www.trainingvillage.gr/etv/upload/etvnews/news/3020-att4-1-style_manual.pdf. EUROPEAN COMMISSION, Recommendation of the European Parliament and of the Council of 18 December 2006 on key competences for lifelong learning. In: Official Journal of the European Union. No. L 394/10, Bruxelles: European Commission, 2006. EVANGELISTA Leonardo. The quest for competence. 2008. MCCLELLAND, David. C. Testing for competence rather than intelligence. In: American Psychologist, No.28(1), p. 1-14, Washington: American Psychological Association, 1973. MCCLELLAND, David C. Identifying competencies with behavioral-event interviews. Psychological Science, 9(5), 331-339, Hoboken NJ: Wiley-Blackwell, 1998. PARSONS, Frank. Choosing a vocation. Boston: Houghton Mifflin, 1909. Nota: Article contained on the website www.orientamento.it. Author © 2006 Leonardo Evangelista (www.leonardoevangelista.it). Published on this website on 25 October 2006. Last modified 8 March 2009. Can be reproduced quoting Author’s name and article’s URL.